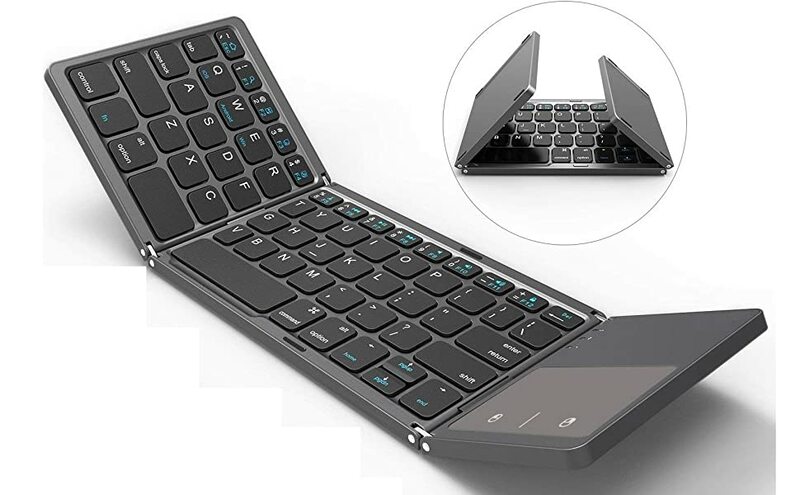 All new Foldable Bluetooth keyboard which provides you with high-quality materials and craftsmanship. A Bluetooth keyboard comes with a comfortable and fast typing experience. 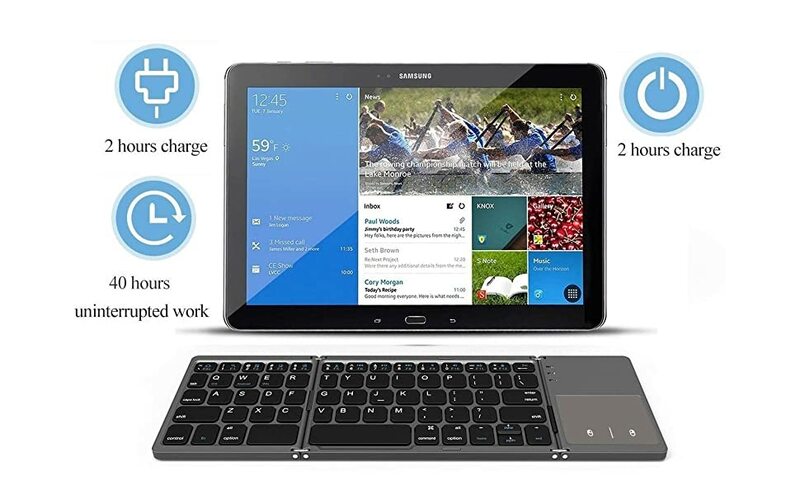 Users can get pleasure from writing time with one charging and you can also put the wireless folding keyboard into the pocket for convenient using anywhere anytime. 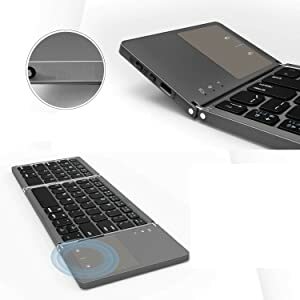 This ultra slim folding Wireless Bluetooth keyboard lets Users can enjoy creating and communicating across multiple platforms on Bluetooth supported devices wirelessly. Travel anywhere portably without the hassle of tangling wires. Compatibility Fully functional to all three major operating system: IOS/Android/Windows, and features system-specific function keys for each operating systems. Compact & Lightweight Convenient and lightweight , folding bluetooth keyboard Comfortable and Quiet Typing. 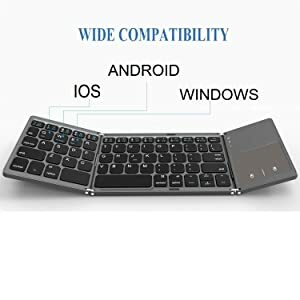 Perfect combo for you: wireless keyboard + touchpad, you can play computer games on the bed or in the sofa comfortably. Wireless BlueTooth 3.0 for fast pairing and wide operating range (<15 meters), no messy cables anymore. The touchpad serves as a mouse, in which you can enjoy smooth, accurate control with multi-touch gestures. Ingenious two-way folding design, handy and portable, even can be folded into a pocket. Ultra-thin body, high sensitivity and good tactility, comfortable typing experience. Scissor type keyboard, lightweight and slim, quick typing, quiet keystroke, good feeling. Perfect 64-key layout, with multi-function keys, compact and excellent, good operating performance. Low-power consumption, support automatic sleep mode for long battery life. Work with most Bluetooth supported device and Powered by 140mAh rechargeable lithium battery. Works most Bluetooth devices with IOS (iPhone 6S/6S Plus/7/ 7Plus, iPad Pro 9.7/iPad Air 2/Air/Mini), Android (Samsung Galaxy Tab, Galaxy S4/S5/S6/S7/S6 Edge/S7 Edge/S6 Edge Plus/ Note4/Note5, LG, Huawei, Nexus)or Windows system. The Pocket foldable wireless mobile keyboard is the easiest, on-the-go solution to smartphone typing. Delivering over 85% the size of a desktop keyboard, the Pocket maintains fast, natural typing, and then folds into a compact, protective travel size case that easily fits into pockets and purses. 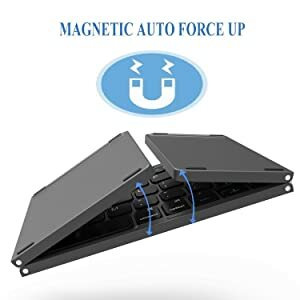 When you fold the keyboard, it close up automatically by Magnetic force on the two sides of the keyboard. so it won't open easily when you put it in bag.